1: Octospora musci-muralis var. 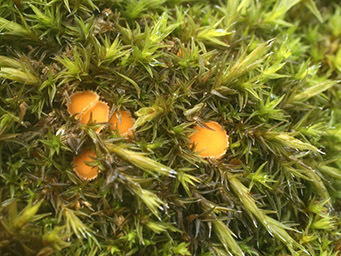 neglecta, apothecia in tuft of Schistidium. Image by Jan Gaisler. 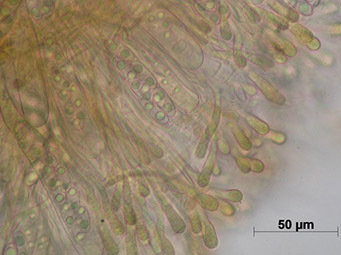 2: Octospora musci-muralis var. 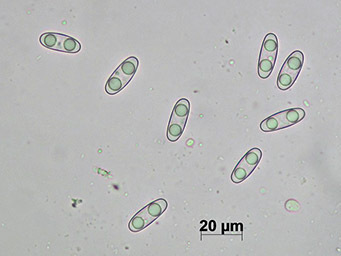 neglecta, free ascospores. Image by Jan Gaisler. Note: This species is very similar to O. musci-muralis but has slighly smaller ascospores and parasites on Schistidium rather than Grimmia. Engel, H. & Hanff, B. 1985. In Nordwestoberfranken gefundene Arten der Gattung Octospora Hedwig ex S. F. Gray. - Die Pilzflora Nordwestoberfrankens 9/A: 3-20.